The basic idea is that this period is usually an up one for the stock market, and my own research shows that it has been up 78% of the time since 1928. But if it goes against that usual bullish tendency, it is supposedly a bearish omen for the year to follow. This year, we find that the official “Santa Claus rally” period did see the S&P 500 close up by 1.29%. That should mean an up year for 2019, if the omen is correct. But let’s look at the statistics, just so we can know how much faith to put into this market adage. What Table 1 shows is that the random probability of an up year has been increasing over time. And so has the ability of the Santa Claus rally to correctly predict a coming up year. But for an indicator to be worth anything, it must beat the random chance of an event, and this is where this particular omen is not all that prescient. 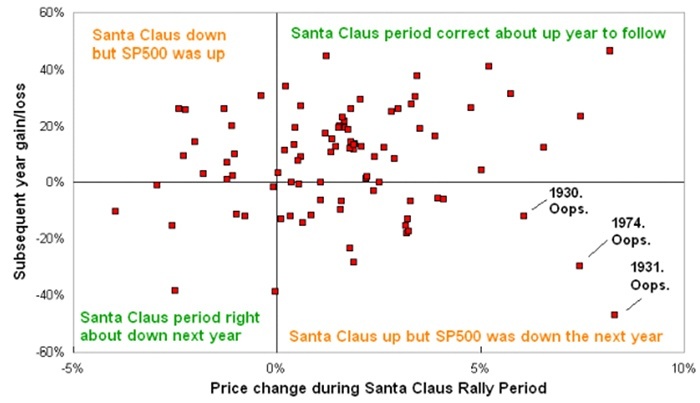 Looking at the data more closely we find that the presence of a Santa Claus rally is just an OK predictor for an up year to follow, just barely beating the random probability. But the absence of a Santa Claus rally is supposed to foretell trouble in the year to follow, and this is where this particular omen comes up wanting. Since 1980, the absence of a Santa Claus rally has only correctly forecast a subsequent down year 36% of the time. Here is a look at this relationship on a scatterplot chart (Figure 1). If the Santa Claus rally forecasting was correct all of the time, then we would see a uniform arrangement of the dots from lower left to upper right. The lower left quadrant is what the omen is really all about, referring to the times when the market is down in late December and how that is supposed to foretell a down year to come. But instead, we find a lot more dots in the upper left quadrant, meaning that there were cases where the absence of a Santa Claus rally was followed by an up year for the S&P 500. In other words, it does not really live up to its billing as a bearish omen. But it is a pretty good bullish signal when that period sees a gain. The presence of a Santa Claus rally has a slightly better than random track record of foretelling an up year to follow. I should emphasize slightly. It would be great if we could have formulaic tendencies that predict the future, and even better if they would rhyme. Humans have a proven tendency to believe statements more if they rhyme. That is why traders believe in Wall Street sayings like “sell in May and go away.” In this case, however, the historical tendency is just better than random on the upside, and wholly deficient on the downside. I thought you should know the facts. A version of this article was first published by McClellan Financial Publications on Jan. 4, 2019.